OhMiBod, a leader in high-tech pleasure products, is gearing up for this year's hottest events, and Club Vibe 3.OH HERO is on the frontline of frisky fun. Whether at Electric Daisy Carnival, Gay Pride, or the local club, let the music blow you away with HERO; the wireless remote-control wearable plug is ready to amp up the excitement with good vibes wherever the musical journey may lead. 'The Club Vibe 3.OH HERO vibrating plug is the most stimulating way to enjoy this year's most in-demand concerts, festivals, or Gay Pride parades," said OhMiBod's co-founder Suki Dunham, who, along with husband Brian, first introduced the musically-powered vibrators to toy fans in 2006. 'There is a sense of exhilaration in letting the music take over your body…when the music is thumping and you're enjoying a show - the pulsations while wearing the Club Vibe 3.OH HERO take it to a whole new level- there is absolutely nothing like it." The Club Vibe 3.OH HERO is quiet and lightweight and features three distinct pleasure modes; the manual Tease mode, where a partner controls the vibe through a remote controller, the Groove mode, equipped with five pre-set pulsations, and the Club mode which responds to ambient sound, whether that's the music or a partner's voice. All of these modes are operated with a rechargeable, wireless remote control that has a built-in microphone, so you can boldly explore epic new levels of sensation! 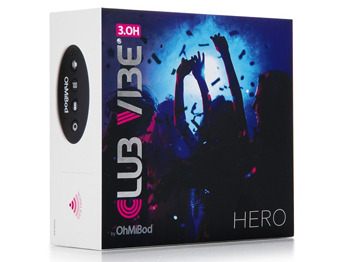 Pick up the OhMiBod Club Vibe 3.OH HERO at Lovelifetoys.com/Club-Vibe-3.OH-Hero and get into the groove at $129.00 suggested retail. For more information on OhMiBod visit www.OhMiBod.com or follow on Twitter @OhMiBod!